I've mentioned it before, but I'll mention it again: I love Lego. I'm a big fan of it, but I can't really justify buying it. Lego board games are a great way for me to buy some Lego while passing it off as part of my board game hobby. Unfortunately, Lego board games don't tend to be very good. I saw Frog Rush in a large supermarket, with a sale sticker that put it at £4. That's a good deal for any board game, but for a board game made out of Lego the purchase was a no-brainer. As with all Lego games, Frog Rush requires construction, and comes with a little instruction book to tell you how to put everything together. 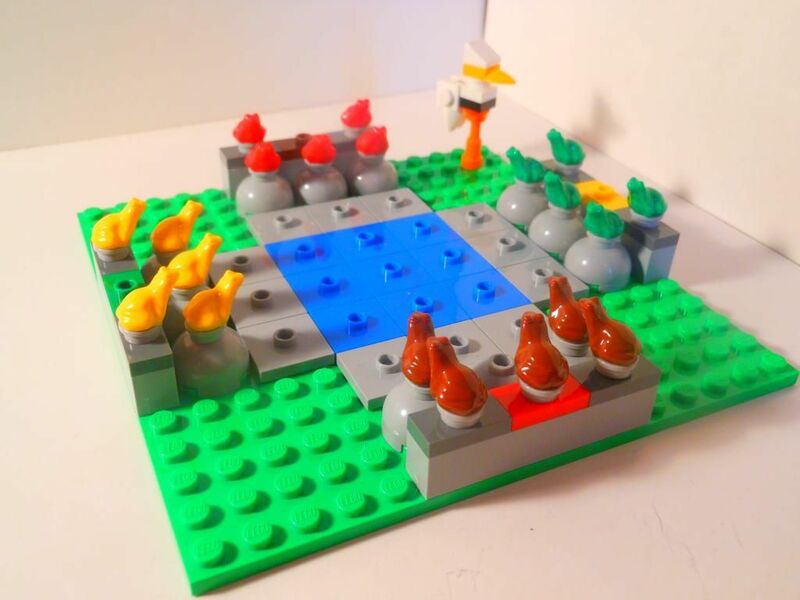 Building the set is often more fun than the actual game, and I am sure there must be some people who would be interested in Frog Rush just to get the extra Lego pieces for custom builds. 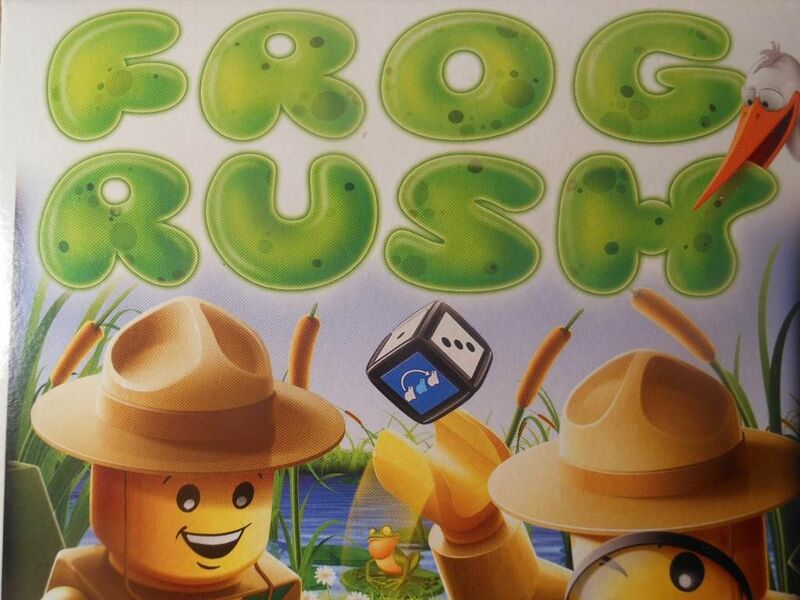 For example, this game ships with 20 frog pieces in four different colours. 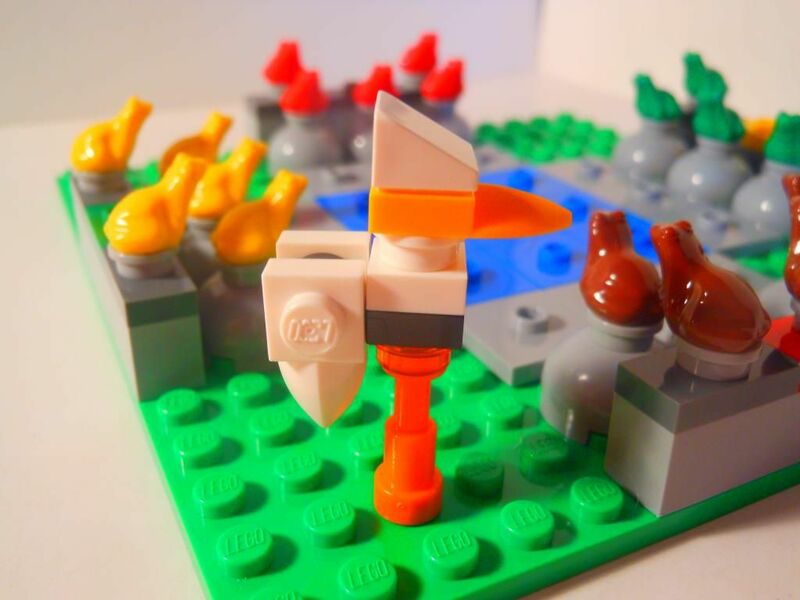 Recently I have seen these pieces turning up as hood ornaments for cars in the Lego Monster Hunter series, and they have even been used upside down as gargoyle heads on the new Arkham Asylum Lego set. Getting 20 frogs (plus another 60 Lego pieces, including a decent-sized green base plate) would surely be a big incentive for a Lego fan to drop £4 on this game. Lego frogs - worth the price of admission alone. Even the dice is buildable, and you can use the faces from dice in other Lego games to create your own custom dice for your own custom games. This is one of the ideas Lego really pushes - the ability to combine game sets, and other Lego blocks you might have, to create new games, or new ways to play existing games. The thing is, I'm not really interested in that; I just want to play the games as they come out of the box. 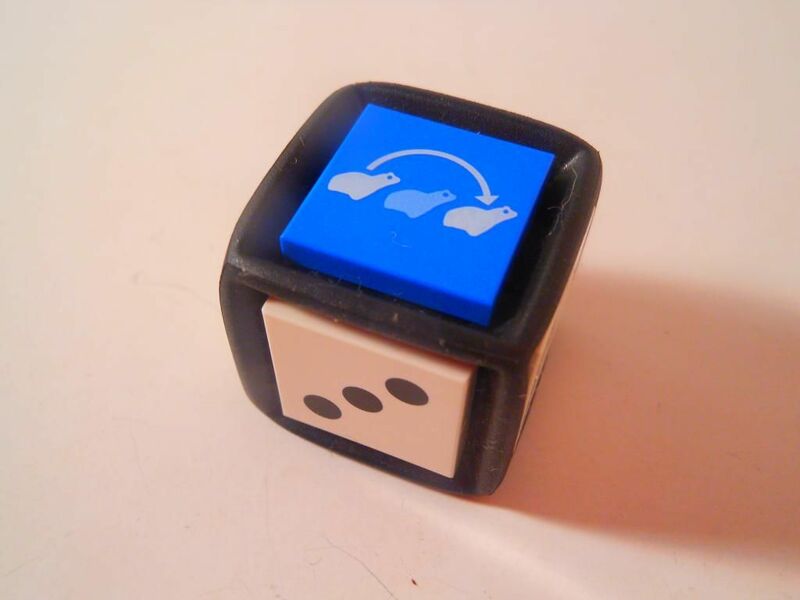 The buildable dice, showing the "hopping" icon. So, what is this game like, out of the box? To be honest, I was pleasantly surprised. This game isn't particularly original, or particularly clever; but it is a nice little filler. It is also quite a good game for younger players, as there is some strategic play, but this is largely offset by the randomness of dice-rolling which makes it a little more chaotic and less of a brain-burning exercise than a purely strategic game would be. The aim of the game is simple: Score points by getting your family of frogs from one side of the pond to the other side. You do this by rolling a dice, and then performing actions based on your roll. Three sides on the dice show pips (as on a normal dice), and this result allows you to move one frog up to that number of spaces. Two sides on the dice show a "hopping" icon, which allows you to hop one of your frogs over an adjacent frog into an empty space beyond. If such a move is not possible, then you can move any frog a single space instead. Finally, one side on the dice is orange. When you roll this, you can move the stork piece to any space occupied by a frog. The frog is eaten, and the stork blocks passage through that space until it moves again. The only frogs safe from the stork are ones that have already crossed the pond and made it "home." As you can see from this description, there is a certain amount of strategic play based on how you move your frogs, but there is also a ridiculous dollop of luck on the top. It is infuriating when you need to move a frog two spaces to get it to safety but only roll a one, and even worse when all your frogs are surrounded but you can't roll a "hopping" icon for love nor money. However, most annoying of all is that stork. If your opponent keeps getting control of the stork, you can see your army of frogs being whittled down rapidly; and there is absolutely nothing you can do about it. It is even possible for your frogs to be wiped out completely. If there was some way you could prevent the stork from attacking your frogs this might be acceptable, but when your fate is entirely determined by the luck of what your opponent rolls, then this is a real problem. That damned stork... I hate that guy. As I said before, Lego encourage you to mix up the rules and play the game your own way, and they even provide a page of variant rules to get you started. Luckily, one of the variant rules is a "stork escape" that allows you to give up your turn to bring a frog back to life. You absolutely must play with this rule, or you will find the stork ruining every single game. It is also worth mentioning that the game really plays best as a two- or four-player game, because of the way the board is laid out; but Lego have thought of this too, and provide instructions for changing the configuration of the board for three players. 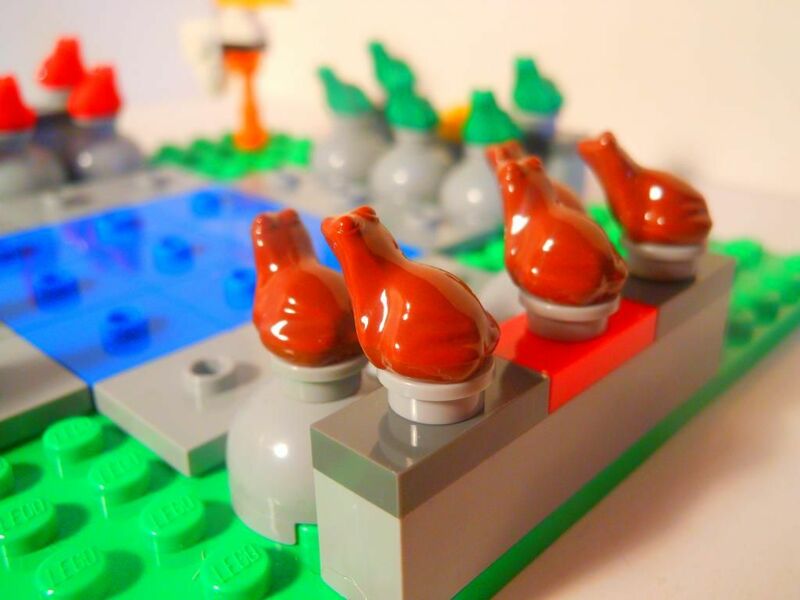 This is a great little touch, and shows how Lego and board games really can work together sometimes to produce good results. Standard board layout (my apologies for the poor lighting on this photo). So overall, no, this isn't the best game ever; and no, I wouldn't have even considered buying this game if it wasn't made of Lego; but never-the-less, I think I have had my share of fun with it considering I only spent £4. My eleven-year-old brother-in-law always asks to play this game, and considering his short attention span, this is a glowing recommendation.